WordPress is an ideal platform for anyone looking to build a great looking, functional website with minimal technical know-how. As user-friendly as WordPress is, and as great as the results are, the more you try to change the layout of certain elements within your site, the sooner you’ll begin to find things a little more difficult than you were perhaps expecting. Visual Composer is actually used by over half a million users. It’s an incredibly popular plugin. Here, we have compiled a collection excellent paid visual composer WordPress themes that are useful for your WordPress blogs. If you want to create a striking and engaging website for you business, check out any of these business themes. They have functional design and loaded with amazing features that can help you create a website that stands out! The others, including those at or near the top of the list, are ideal for just about anything. We hope you find a theme that perfectly fits your needs. 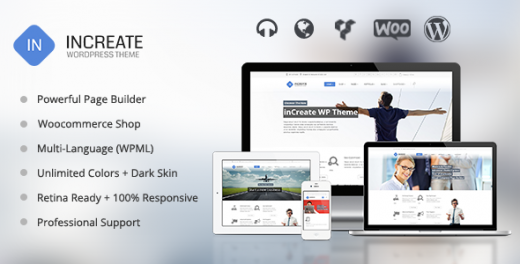 Emulate is a clean, modern design multipurpose wordpress theme can be used for any type of website build professional and modern websites. Control every pixel of this theme. 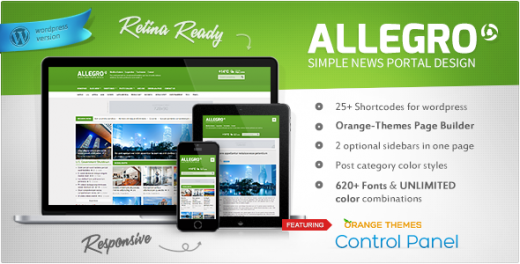 Set your colors, background patterns, change fonts, change layouts for different pages. It comes with 4 default homepage and 3 ready-make skins, you can easy to build a site as the demo via importing the xml files. 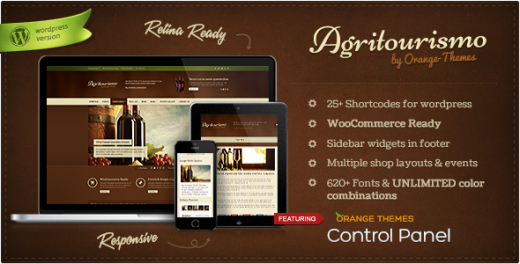 Agritoursimo theme is designed for wineries, eco products merchants, cheese producers, agricultural and tourist sites, also for other industries. Unlimited homepages styles. You will be able to create your own homepage by dragging and dropping blocks. This theme is has a separate gallery system. 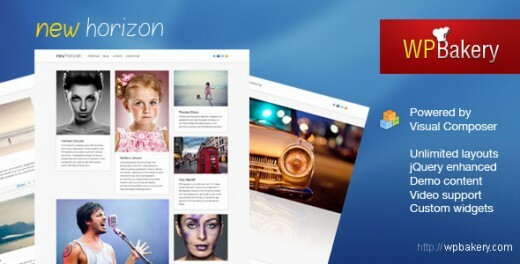 You can choose between two styles of galleries: fancy box and standard jquery gallery. 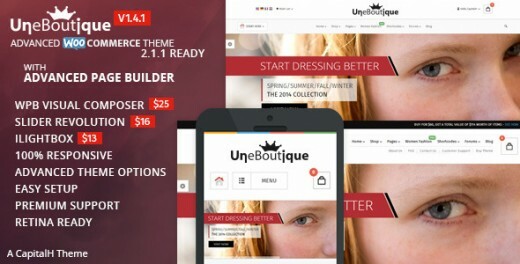 Ultimate eCommerce & Corporate Theme is a clean, feature full theme for WordPress and WooCommerce. With the power of Master Slider, Visual Composer advanced page builder, and Slider Revolution and iLightBox premium plugins, Une Boutique brings to you one of the most complete eCommerce and Corporate themes on Themeforest to help you start your online store beautifully and with ease. 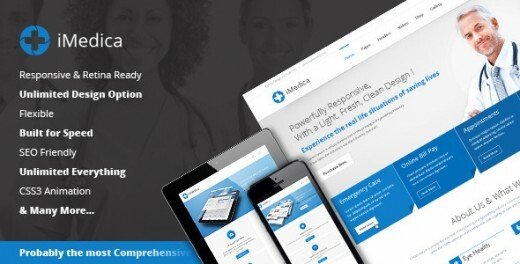 iMedica is probably the most comprehensive & feature rich WordPress theme that’s made for medical organizations. 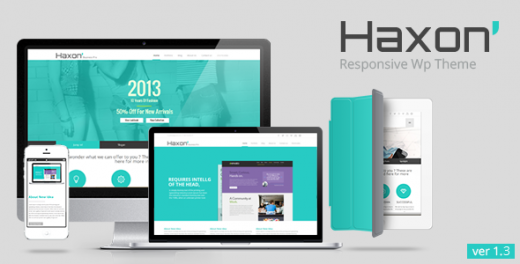 Responsive code, retina ready graphics, lightweight framework and very flexible structure makes it outstanding. iMedica comes with a well designed and categorized admin panel. With this level of simplicity, making customizations was never easier. Excellent SEO markup is one of the core value we have put in iMedica. Get iMedica for your website tell Google that you are coming. 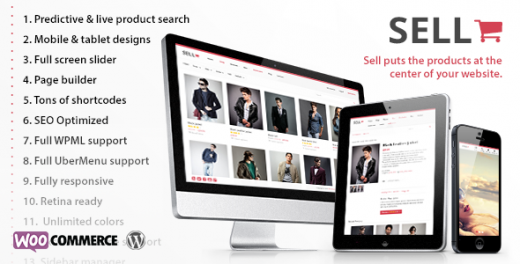 Sell is a beautifully designed, super flexible WooCommerce theme that is suitable for any type of products. The theme puts your products at the center of the site with a minimalistic design that doesn’t get in the way, product page content is loaded above the fold and predictive and live search make finding products really easy. Color pickers to change every color in the theme. Options to control each post, page, category individually or globally. 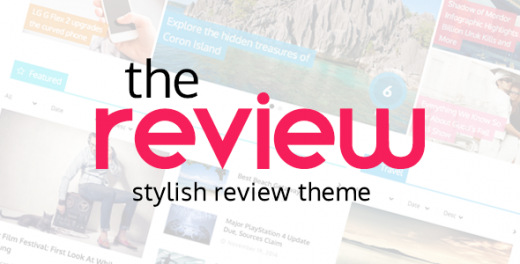 New Horizon is perfect for design/fashion orientated blogs or for creative people who’s tired of regular thumbnails grids layouts. As a free Bonus you’ll get the award winning Visual Composer plugin integrated into the theme, which lets you to create complex layouts with simple drag-n-drop interface. Tabs, sliders, buttons, call to action blocks, twitter feed, posts grid. 7 predefined transitions effects (fade, slide top, slide right, slide bottom, slide left, carousel right, carousel left). 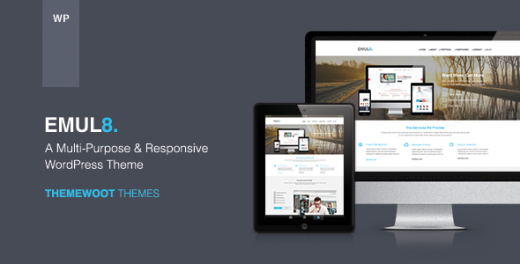 EWA is one of amazing WordPress theme that you could not miss. 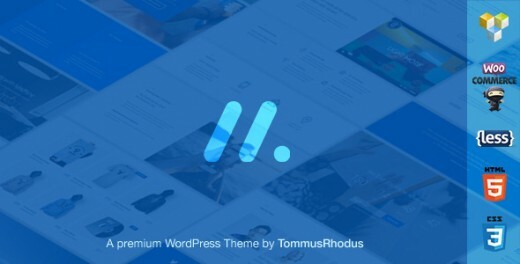 Fully Responsive Theme providing 15 pre-defined skins with stunning looks, you will get more than a premium WordPress theme.Those 15 skins show you the unlimited customization possibility of this theme. EWA allows you to automatically set any custom TrueType or OpenType font absolutely anywhere you want on your WordPress site. 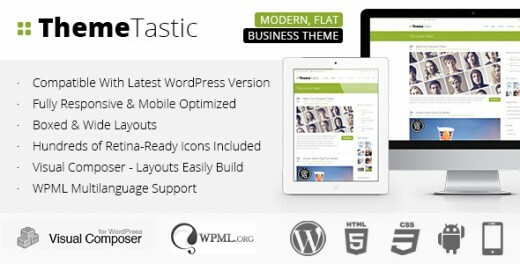 ThemeTastic is a modern, flat, business WordPress Theme with a wide range of possible uses and lots of customization options. Two elite authors (Damojo & Themepunch) have again combined their efforts to create a mind-blowing product with all the goodies you need. Unique 3D Slider Caption Effect which can of course be deactivated. Build Content easily with Visual Composer and/or Shortcodes. Various Post Formats With Image, Slideshow, Youtube & Vimeo Video support. Kourse is a responsive content driven landing page WordPress theme created for authorities who wants to boast their internet presence. It is designed to increase your conversion rate and look professional behind the knowledge you’re about to share. Visual Composer has been carefully tailored to fit Kourse’s needs to bring you a theme that takes your pain away of creating landing pages and focus on selling your product. 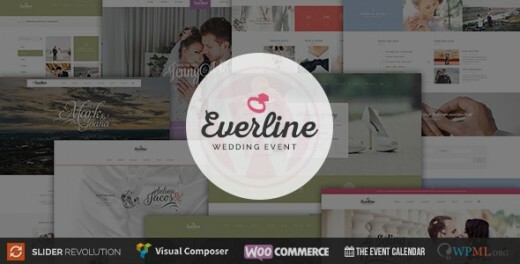 Everline Wedding WordPress Theme, coming with elegant and modest appearance, will be a meaningful WordPress theme for Wedding, Engagement and other event purposes. Its stunning beauty, fashionable clean look and proper execution, accompanying with making use of Visual Composer, WooCommerce, WPML, The Events Calendar and Revolution Slider plugin, will help you to own an awesome wedding site for your happiest day. Machine is the distillation of our vision to deliver a truly premium experience to web professionals and newcomers alike. Taking cues from the contemporary and authentic, Machine assembles the best of the modern web in one remarkable template. Combined with the customisation power of Visual Composer Page Builder, Machine is the only “startup framework” you need to kick off your next landing page, portfolio, or multi purpose project. 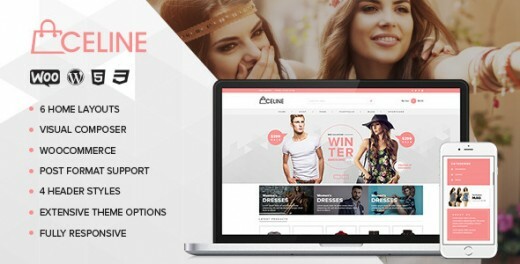 Celine is a Premium, Responsive WooCommerce theme with a clean and modern design. It’s perfect for any kind of web shop. It looks great with all types of devices (laptops, tablets and mobiles). Open demo site and resize the browser window. It’s packed with an amazing Visul Composer and advanced theme option panel. 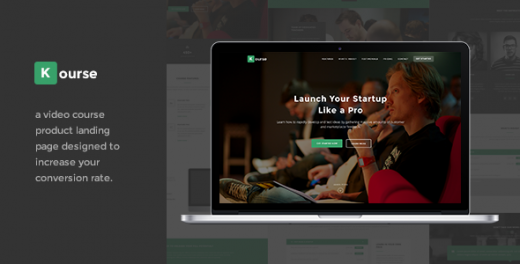 inCreate allows you to create stunning responsive websites. Responsive Layout that addapts to smaller devices (tested on iphone, ipad, etc). WPML plugin ready:WPML Plugin, in case your business needs a multi language site. Ability to change the sidebar alignment to left/right or disable it generally and page/post specifically. Typography options, choose custom Google fonts for navigation, sidebar heading, body, and headings. Child theme support for easy customization, that is not affected by theme updates. Sk8er is an iOS8 Inspired Multi-Purpose Parallax WooCommerce enabled theme with a clean and professional design which will be a great solution for your business, portfolio, blog or any other purpose. Sk8er is a modern theme with fully responsive design. It has a wide range of features and comes with bunch of popular plugins such as Visual Composer and Revolution Slider. It is very easy to customize and comes with detailed documentation and top notch support. 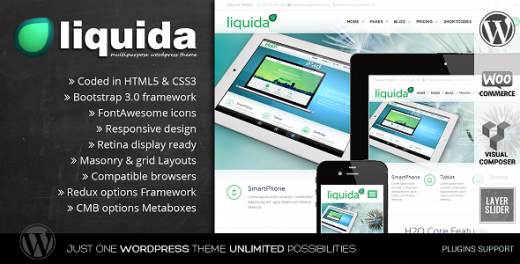 Liquida is a clean, powerful & multipurpose wordpress theme that can be used to build professional and modern websites. You can set your colors, change fonts, background patterns & the layouts in different pages. Also it comes with 5 default homepage, 6 blog layouts and 6 ready-make skins that you can combine. 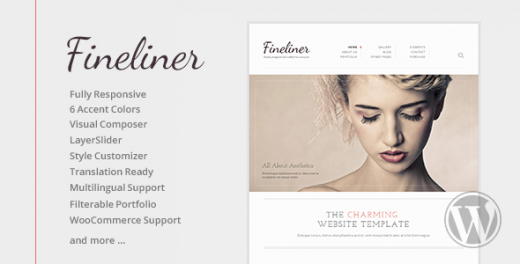 Fineliner is a beautiful and clean responsive WordPress theme that is perfectly suitable for building any portfolio or business websites. The theme comes with 6 accent colors and you can adjust more using Style Customize module. 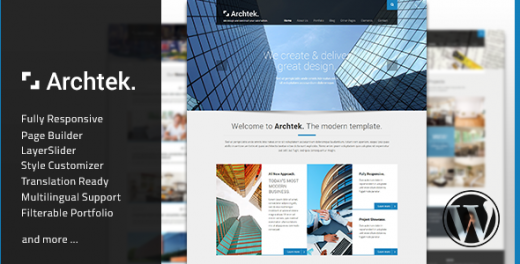 It also comes with a powerful page builder powered by Visual Composer plugin. Another premium LayerSlider plugin for managing wonderful sliders is also included. Allegro has it’s own Bannery system, in which you can add images, text, videos or any other type of HTML code. You can add/edit all effects ( how often banners will show up, after how much seconds it will disappear, effects, fly in time e.c. Allegro has it’s own Bannery system, in which you can add images, text, videos or any other type of HTML code. Unlimited homepages styles. You will be able to create your own homepage by dragging and dropping blocks. Unlimited sidebars and you can assign them to each page or post. To one page you can assign up to 2 sidebars. This theme is offered together with 11 widgets adjusted for the theme.